This Article explores the rule of law aspects of the intersection between intellectual property and antitrust law. Contemporary discussions and debates on intellectual property (IP), antitrust, and the intersection between them are typically framed in economically oriented terms. This Article, however, shows that there is more law in law than just economics. It demonstrates how the rule of law has influenced the development of several IP doctrines, and the interface between IP and antitrust, in important, albeit not always acknowledged, ways. In particular, it argues that some limitations on IP rights, such as exhaustion and limitations on tying arrangements, are grounded in rule of law principles restricting the arbitrary exercise of legal power, rather than solely in considerations of economic efficiency. The historical development of IP law has reflected several tensions, both economic and political, that lie at the heart of the constitutional order of the modern state: the tension between the benefits of free competition and the recognition that some restraints on competition may be beneficial and justified; the concern that power, even when conferred in the public interest, can often be abused and arbitrarily applied to advance private interests; and the tension between freedom of contract and property and freedom of trade. 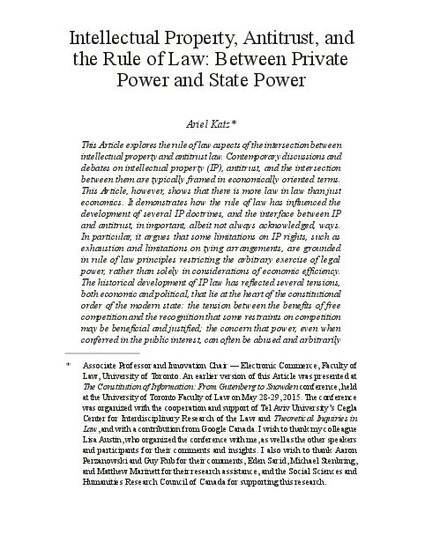 This Article explores how rule of law considerations have allowed courts to mediate these tensions, both in their familiar public law aspects but also in their less conspicuous private law dimensions, and how, in particular, they have shaped the development of IP doctrine and its intersection with antitrust law and the common law.